Ever since I can remember I have loved food. I love eating it, cooking it, ordering it, shopping for it . . . talking about it! I’ve been cooking ever since the day I moved out of my parents’ home, aged 22. Little did I know how much cooking and food would eventually help me in my life, and now at the age of 38 I’m so grateful to be able to say that food not only helped me achieve some amazing new goals, but also helped me with a long-term condition, generalised anxiety disorder (GAD). My mum had always cooked for me and even when I left home she continued, normally by regularly “posting” bacon sandwiches through the front door (which in all honesty became slightly embarrassing when I had company). I knew at that point it was probably time to learn for myself, and I’ve been cooking ever since. However, something brilliant happened as I began to learn to cook. I had suffered from GAD from my late teens, and had found it progressively getting worse in my 20s to where, at the height of my condition, it prevented me from leaving the house. But, as soon as I turned on the oven and started chopping, I felt a wave of calm and clarity come over me. Don’t get me wrong, I still suffered severely from GAD, but as long as I was in the kitchen cooking and thinking about food, my panic seemed to be put on hold for a little while. Like most other people I know, I’ve always been an avid watcher of TV cookery programmes – pretty much nothing else graces my screen (apart from the odd Hammer House of Horror film). I’m, therefore, a massive fan of a lot of TV chefs, with my absolute hero being Rick Stein. I’ve watched everything he’s ever done, I own all his programmes on DVD, I have every book he has ever released and I have even downloaded the instrumental music from all his TV shows (to my wife’s annoyance). From my late teens when I began to suffer from GAD, his programmes were one of the only things that helped to calm me down. They inspired me to get up, get out of the house and travel, which previously I had really struggled with. Rick taught me that there was a beautiful world out there and because of him I fell in love with travel and food. I had intended on getting it tattooed on to me afterwards, but my wife, probably wisely, advised against it. I never actually got the chance to say thanks for all he had done for me. 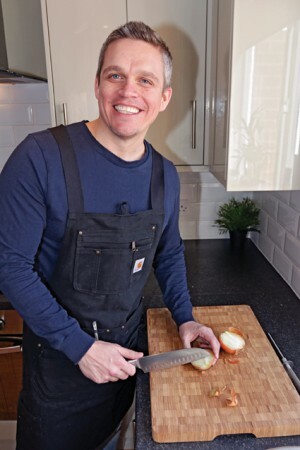 Fast forward to 2019, and I’ve found through cooking a confidence to push myself and to try new things – culminating in becoming a MasterChef contestant in the TV show’s 15th series. Never in my wildest dreams, at age 22 suffering severe panic attacks, would I have imagined I would be on TV doing something I absolutely adore. My wife and I have since begun a catering company called Canary & Kitchen, aiming to provide unique home-dining experiences to people in and around the local area. We’ve been lucky enough to have catered four different events in our first month, one of which was cooking for the Birmingham City Football Club captain and his team mates. So, I suppose you never know what’s around the corner, and that’s pretty exciting!